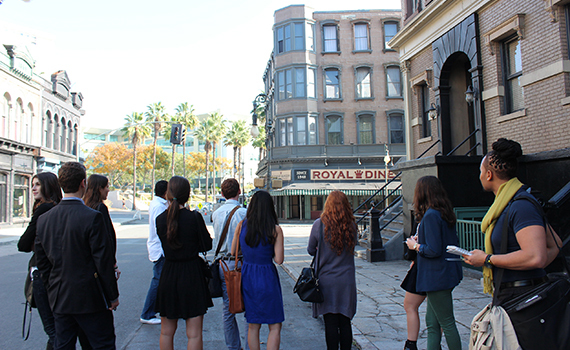 Palm trees in New York City: entertainment group students tour a Fox Television set in LA. A group of ten students representing the Colgate Entertainment Group explored the worlds of film and television on January 14 and 15 in Los Angeles, while a second group of students learned more about the real estate field in New York City. Read student accounts of the two trips below. During the LA immersion trip, alumni explained their paths to their current positions — grads like Stephen Brown ’81, EVP of programming and development at 20th Century Fox Television; Steven Brookman ’81, head of Motion Picture Business Affairs at the Creative Arts Agency; Eugene Young ’81, president of Ryan Seacrest Productions; and Amanda Brown ’01, vice president of production at Paramount Pictures. Brown hosted us at Fox, where we had a tour of the costume warehouse, a New York City set, and the sets of Modern Family. Brookman, who is head of the Colgate entertainment professional network, hosted our group, along with several young alumni, at his home for a networking dinner. The discussions with alumni and their co-workers provided a close look at the entertainment industry, and each had his or her own words of advice. I am so glad to have had a firsthand look into so many different aspects of the entertainment world. I realize the breadth of the industry and the many opportunities available, and I am thankful to have seen how graduates paved their individual paths to Los Angeles — how Colgate prepared them each for their positions. The 2015 Colgate Real Estate Professional Network immersion trip was a busy day and a half of networking with and learning from talented Colgate alumni from just about every aspect of the industry. From various informational panels and site visits to social receptions, we had countless opportunities to question and interact with established alumni, as well as younger grads, who shared their stories on their transition from Colgate to commercial real estate. The trip was a useful chance to learn about the responsibilities of different roles within the business. Many of us found departments or divisions that interested us, and we were able to pursue those interests at a networking reception hosted in midtown Manhattan. All of the alumni participants were eager to help us in any way possible — in fact, several alumni connections made on the immersion trip have led to job interviews. We learned about the industry from some of the best in the business and we received real world experience as we navigated the crowded streets of New York. Some of us learned for the first time that the subway system is a bit more complicated than our faithful Colgate Cruisers.